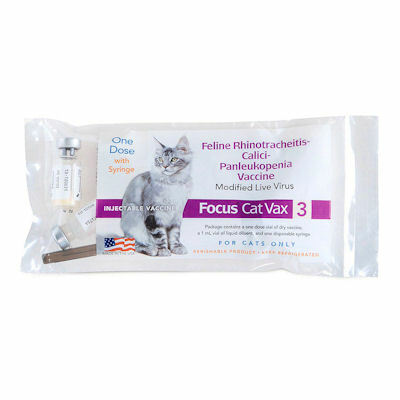 Focus Cat Vac 3 (Boehringer-Ingelheim) single dose with syringe and needle. This 3 way vaccine aids in the prevention of diseases caused by Feline Rhinotracheitis,Calicivirus and Panleukopenia(feline distemper) viruses. All three of these diseases are highly contagious. Dosage and Administration: Two doses are required for primary immunization. Initial vaccination: Inject 1 dose (1 mL) for cats or kittens subcutaneously at 8 weeks of age or older. Second vaccination: Inject 1 dose (1 mL) subcutaneously 3 to 4 weeks following the initial vaccination. Warning: Do not vaccinate pregnant queens.